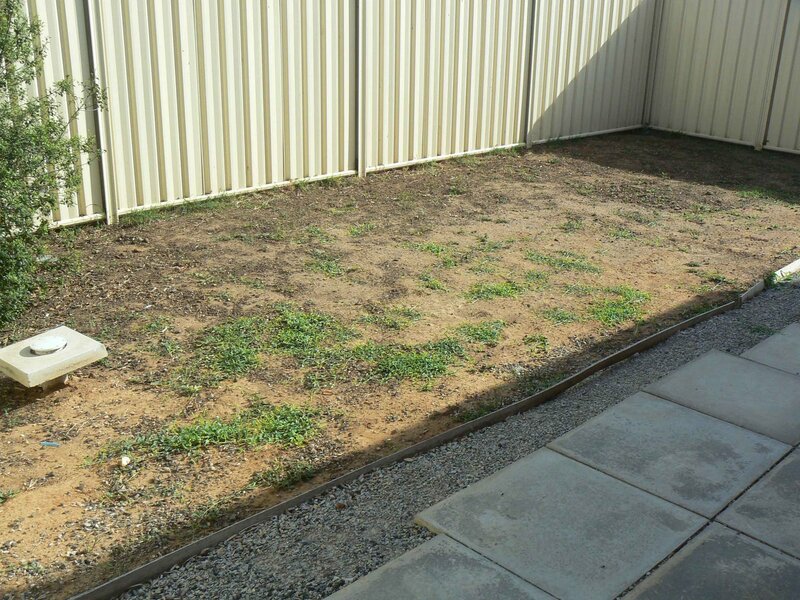 A little while ago I received an email from Turf Australia asking whether I was interested in a backyard makeover consultation. It just so happened to be perfect timing, as after living in this house for around four and a half years and not really being able to go outside and enjoy the garden, it's high time I made the most of it. Bruce from ANC Turf (my local supplier) came to visit on Friday, and I told him what I needed in the backyard. My number one priority was a concrete patio which can also double as a basketball area (I used the nephews as an excuse for needing the basketball ring, but really it's for me)! He suggested sticking with the geometric theme and building garden beds around the perimeter, as I already have the bottoms of the fences re-inforced with wood (that was to prevent Mr Limpy Houdini Dog escaping). 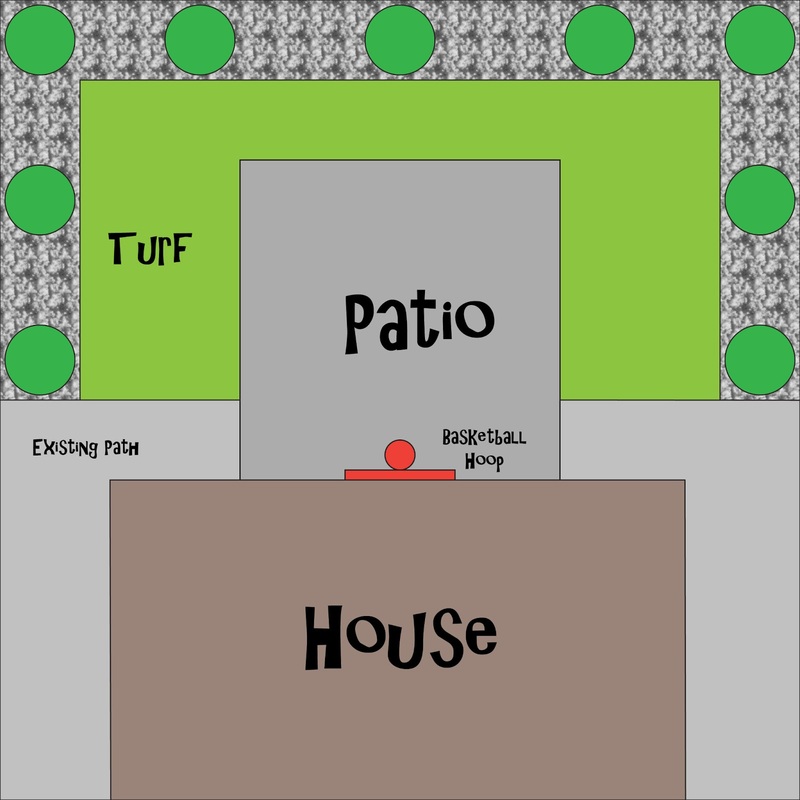 Then he suggested filling in the areas around the patio and garden beds with turf - specifically Buffalo as the garden is in part to full sun for most of the day, and it's also hardy and can withstand kids and pets! I can re-use all of the concrete pavers on the side paths and even do some planting around those areas too, which will soften the look and provide a nicer view out the windows. Here's the plan of what I'd like to do (not to scale yet). Bruce suggested that Spring would be the best time to lay turf and to plant the garden beds, so if I can get all of the hard landscaping done by then, then I just need to give him a call and order the amount of square metres that I need. I can lay the turf myself, or they can provide that service too. I'm really happy with my plan and now I need to start saving to get it all done! Now if you're a bit of a fan of DIY like me, this is the best bit - Turf Australia have given me a $250 Bunnings Voucher to give away to one lucky reader. All you need to do is leave me a comment and tell me what you'd spend it on (I'd love to know)! Entries close at 8PM AEST Sunday night 14th July. I'll draw a winner and Turf Australia will send you out the voucher in the mail. Ohh, I could use that voucher! We live right next to native parklands and are tired of constantly cleaning out gumleaves that fall into our gutters. I would buy the best gutter guards one can find to protect my gutters from blocking up and hopefully reducing the amount of time we spend clearing them out! With 2 sick kids on a very restricted diet, I'd spend it on the veggie patch so I can know for sure that what they eat is organic and not covered in chemicals. Oooh excellent ~ I am a Bunnings-a-holic and incessant DIYer! I would use the voucher to buy a new bench seat for the garden, along with some turquoise paint to paint it with, and maybe a new plant to sit next to it! Hope you get the outdoor space in time for summer. Nothing better then a sunny spot! I was thinking 125 sausages on bread but perhaps with the increasing family; storage shelving and containers is always needed and a better option! Cam your backyard is going to be so cool! I'd like to see a couple of snaps of you out there dunking some hoops! I would use the voucher to buy reno items like a bath or shower. It would be a huge help as we are doing it all ourselves on a tight budget! citrus trees, poo, a chiminea, or maybe a chicken coop. I love Bunnings! Ooh, I could spend this voucher 50 times over! However, I think it would go towards thick black plastic sheeting, so we can finally get rid of our asbestos roof. Or it could go towards paint and plaster to fix hols in the walls and to make them pretty. Or it could be a step in the direction of fixing some flooring, so I don't fall through them. Or.....!! I would love to win this! I live in the city, so I have a balcony vegetable garden. I am currently growing tomatoes, soy beans, broccoli and a lot of different herbs but I would love to get some more pots and soil and grow something new - perhaps cucumbers, zucchinis, snow peas and beans! I'd love to be able to turf my back yard; mud and puppies with fluffy feet are a bad mix. She gets a foot bath almost every day at the moment! Wow, $250 shopping spree at Bunnings - awesome stuff! I think I'd spend it on stuff to make raised garden beds - I'm too old to get on my knees & weed nowadays! That looks brilliant Cam! I saw somewhere recently where they painted the odd old paver and it looked really good! Ooh your yard is going to look great! I have been eyeing off some doors from Bunnings so I can close off my sewing room to the rest of the house. Hmmm. What I'd spend it on? Or hubby? (and I do need me a good glue gun for a start) but "we" would probably spend it on a new whipper snipper. Because a new one that worked would be much more useful that our old one that doesn't. That sounds exciting, I'd love to have a garden consultation. We have not had good luck keeping things alive and I just keep randomly planting shrubs here and there with no real plan. The only thing I've kept alive are our fruit trees so I would probably spent the voucher on some more of those. A plum tree and and an orange I think. Plus a few more shrubs to try and keep alive. I could probably do with a few vouchers with the length of my Bunnings list but to start with I'd love to tidy up our homes front entry with some driveway paint (the old concrete is currently a brighter forest green than has ever been fashionable!) in a dark grey, blue flowering lavender and rosemary for the planter and a pot of Dublin Blue high gloss to freshen up the front door. Gosh, I would buy fruit trees to espalier along my back fence to provide delicious screening! we need a shed desperately for all our garden things ! Hard choice, but at the moment it would be an OVEN! The oven in this house is doing my head in! I've also heard (seen on IG) that Bunnings now sell rotary cutters - I'd be stocking up on those suckers!!! HOLY COW! I just had a thought - how many sausage sandwiches do you think that would get me at the Bunnings sausage sizzle!!!! I think the gardening plans sound wonderful - can't wait to see the magic come spring! I'm looking forward to seeing what your view out your back windows will look like soon! Come on Spring!! Not being the Bunnings shopper in my house - that is my hubbie's favourite haunt - I may not be the best person to nominate what to use the voucher for BUT if we can buy turf there - that would just be ACE - weed and dog wee does not a nice lawn make! Also a pitch fork for digging out some aggies that are holding on for dear life. I like the idea of a nice porch set to sit on to view the person who gets to dig them out hehehe! Can't wait to see how it all comes together for you. Hands down, I know exactly what I'd treat myself to at Bunnings. I'd love a Dremel tool. I'd use it for pretty much everything - home fixes, craft, happiness. Our house has been 'under renovation' for 3 years now and I am living with a garden of mud, an outside washing machine and many unfinished rooms. The thing I miss most is a garden and can't wait to buy and plant, plants!! oooo... Bunnings is one of our favourite shops!! I'd probably buy my husband a welding thingamajig. He wants one for his birthday and less money out of my wallet for these things, means more fabric for me :) Yes, I'm selfish like that! I'd spend it on the never ending little bits and pieces that we need since buying a doer upper. Maybe tile adhesive, paint, all manner of stuff like that! I would love to buy some artificial turf for around my pool, or some plants. Would really like some berry bushes or fruit trees too. My daughter would like a cubby house too... The list goes on and on I do love bunnings! 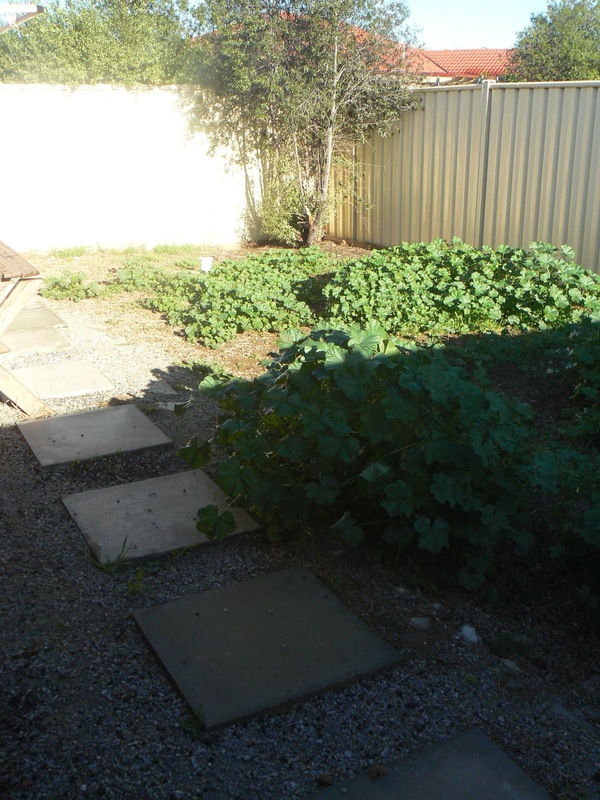 I've got a great little area that needs a makeover...it will be lovely in the summer with a nice outdoor setting, it is very shady and cool in the heat. Make a veggie patch..near my rainwater tank..and fix the tanks leaking connection! Master Nine wants to start his own vegie patch, so this would go a long way to buying all the things we'll need. Our home was built with no eaves on the north side. You can imagine how heat is let in during a Perth summer! I'd love to have some shade sales attached to that side of our home. I would buy some plants to make my home a more green and sustainable place to live in. Can you tell I'm happiest making marmalade? Something my staffy 'Tiny' could sleep in/on that he cant possibly eat...hes has destroyed 3 of his mattresses and torn them apart...my lawn looks like 50 sheep have been shorn all over it, its a mess!!! WOW! $250 TO SPEND AT BUNNINGS! AS MUCH AS I SHOULD PUT IT TOWARDS A NEW LAWNMOWER AS WE DEFINITELY NEED ONE, A NICE, COMFY SUN-LOUNGE SOUNDS MUCH BETTER AND THEN I CAN SIT BACK, RELAX, AND WATCH HUBBY STRUGGLE WITH OUR OLD MOWER!! Unfortunately we don't have a backyard but I have high hopes of turning our top floor balcony into a little oasis. I'd spend the voucher on an outdoor setting and some plants, and maybe some herbs for a herb garden wall! I'd use it to repair the mess hubby made of our bathroom....he thought he would install a skylight for me but didn't measure where he wanted it or anything! He just kept cutting holes in the ceiling till he got the spot that he wanted...now I'm left with a ceiling that looks like swiss cheese! I could buy some eaves for the house to make things a bit warmer in winter. I would spend it on a swing and slide for kids! I'd use it to buy lawn and plants for my backyard. It's looking rather sad outside at the moment. a patch of grass would be nice - a more manicured space. Would love to throw in some colour and some herbs for dinner. Turn the Sahara desert into the Garden of Eden!! My mum is going on her first overseas trip in over 25 years in a few months time! While she's away I'm hoping to pull off a backyard blitz and transform our rundown, muddy and empty backyard into an urban oasis! As you can see, it's looking a little worse for wear with all the traffic it gets from our two large rescue dogs ( http://i62.photobucket.com/albums/h112/syd_and_lauren/IMG_1606_zps3737ec24.jpg ). I'd love to purchase some rolls of turf, new plants and edging tiles and the equipment to install a pond and water feature at our local Bunnings! I would use it to make over my Dad's courtyard in his unit as it is just concrete. He is a wonderful person who has raised my 8 year old niece from 3 months of age. He needs some pavers/decking and maybe art. turf and plants. I must confess, My home and garden renos are a mess, Ran out of money but with a Bunnings voucher this I can redress, becomng a painting goddess. and just waiting for the day.